It makes economic sense to a lot of vested interests to say yes, it can. I’m not so sure. Yes, you can learn the structures, tropes and styles of writing, but without the innate ability to tell a story well, you’re working at a disadvantage. Not that this stops some of the crime writers you’ll find selling very nicely in WH Smith or Tesco. It’s an odd thing; no writers can win an award without being able to write, but if you dare to say that all artists must be able to draw, you’ll be branded a fool by the art establishment. So it’s a combination of style – which develops naturally in the writer – and knowledge of construction, which is partly innate and can then be further developed or learned. When I occasionally take a writing class, there’s always someone who has the natural ability to be interesting in print. There are a lot of How To Write books out there – most of them will only teach you to write to a market. They’re the kind that take out ads saying ‘You can make big money writing! Start earning today!’ And yes, you might be able to make money at the lower end of the ad industry, but that’s not what we’re talking about here. The best writers have no magic formula, and often switch styles and formats. Or they may specialise and mine one subject for years. There’s an excellent book called ‘The Seven Basic Plots’ by Christopher Booker, who goes through history outlining the stories that have stuck with us. But even those successful stories have stayed around partly by accident. 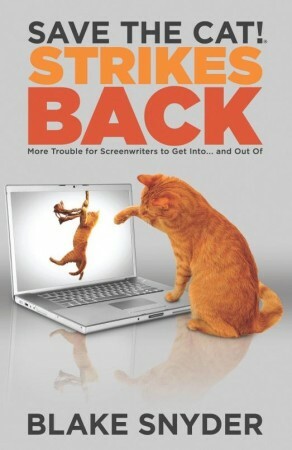 I’d actually suggest reading some screenplay books if you’re interested in construction. I rather like Blake Snyder’s ‘Save The Cat!’ books, although he focusses very narrowly on Hollywood and makes terrible generalisations. For example,he calls ‘Fatal Attraction’ the best cautionary tale about fooling around ever made, but that prize clearly belongs – by a long margin – to ‘Elles N’oublient Pas’ (They never forget), which suggests that a man’s indiscretions will haunt him forever. Of course, you can’t see the latter because it wasn’t made in Hollywood and therefore does not exist. But the books are a fun overview on telling stories well and worth thumbing through. After that, the best How To Write books are the novels that do it will. The best way to learn is by example and experience. But if there are other good ones out there, please share. There are, it seems to me, two basic categories of writers, which, ideally, should be combined as one: you have your stylists, who can write well, elegant prose one can savour as a fine wine; and your storytellers, who sometimes have a very dull style (I was surprised recently, upon re-reading some James Clavell, to discover most of his sentences were built around the verb to be) but whose narration just rivet you. Writing courses, up to a point, can provide you with some pointers you would probably pick up for yourself in the longer run, but it seems to me being a writer is mainly a combination of natural abilities, a capacity for self-criticism and practice — lots of it. Chris – I am very pleased to see you single out Blake’s book. The one you have pictured is the second of three. Sadly, Blake passed away before the last one was published. He became a dear friend to me and many others who followed his theories and took his classes. I too shy away from books promising magic formulas and easy solutions. What makes Blake’s books special is their playful explortion of structural prototypes and evealuations of genres (albeit from the classic Hollywood POV). Far more accessible and functional than McKee. Additionally, I have found many of Linda Segar’s books informative and inspiring. Of course you can’t go wrong with the classic, ADVENTURES IN THE SCREEN TRADE by William Goldman, in which he famously states: “Nobody knows anything”! Couldn’t agree with you more about the vested interests. Over the years I’ve encountered numerous people who’ve paid through the nose to attend some of the most prestigious writing courses around. You should read some of the fiction these people produce. Shockingly bad doesn’t even come close to describing it, yet their work always receives high marks and praise from the instructors no matter how unreadable it is. These people then graduate with a hopelessly deluded sense of their own abilities which only makes everything that much harder when they fail to get published in the real world. Worse still are the ones who somehow do end up getting published, which may help explain why there are so many awful books around these days. But I think a major problem is the whole approach to writing itself. I’ve lost count of the amount of times I’ve read an author state that their reasons for becoming a writer were mostly economical. They don’t love the genre they work in and don’t even particularly have a love for words and literature, but at school they got decent grades in English so they did some research and crunched the numbers and decided to write romance or crime novels because they were the most lucrative. No wonder so many books these days are devoid of passion and flare. With an attitude like this, how could it be otherwise? James, a wonderful little piece. The other possibly terrible influence is the, usually female, writing circle which is thanked in florid terms in each published volume. These appear to be groups of women writing, or trying to write, chick crime novels. I’m suspicious of a fluff novel introduced by two pages of thanks to everyone including the horses, cats, and dogs. I turned away from a chick crime with just such an introduction because I still had the taste of a Laurie King novel in my mind. I wonder how many of these people have had to go through years of rejection letters before their books began to be published. re Helen’s comment above: Rejection of the stuff of the writer’s life! Do check out Stephen King’s ON WRITING for his moving and inspiring take on the craft – and on rejection! Yeah, I’ve read that King book, and found it enlightening. But the only thing it really illuminates is Stephen King’s take on it. Having spoken with Admin a bit about this, I know his approach is very different from King’s. I get the impression that each writer has a very individual take on what writing actually is. Having been a voracious reader for more than half a century, it’s very easy for me to say, “What a horribly constructed sentence!” and “Good grief, you could drive a car through that hole in the plot!” But….having begun work on our first novel (my wife and yours truly), I can tell you it’s easy to criticize, but good lord, actually DOING it…..it’s a whole different universe. Writing is work, and writing well is HARD work. At lest…for us. Hats off to all good writers, particularly Mr. Admin! Helen, I know what you mean about those gushing thank you lists that go on and on. Always a big red flag. I’ve never attended a writers group before but as an aspiring writer myself, I couldn’t think of anything more detrimental than having my work picked apart by a bunch of amateurs on a regular basis. Writing is a solitary activity. Rick and Steve, I enjoyed King’s On Writing but didn’t find it that insightful. But that’s probably because by that point I’d already read a hundred other such books and was realizing that no one can really teach you how to write. You have to find your own way. Writing well is damn hard work. I’m totally with you on that. I’ve worked like a demon to try and finish a few novels and a stack of short stories yet I’m still not totally happy with any of them. As for rejections, they’re the real test. Every one is like a sucker punch to the guts, and the more you loved the story, the more you believed in it, the more confident you were that it was going to be accepted, the worse the pain. It can destroy your confidence and make you doubt your sanity for being foolish enough to invest so much time in something that went nowhere. But as you say, it’s only when seriously attempt to write something yourself that you start to understand just how good writers like Admin really are. Right on. I know there are minor authors (and would you want to be called a minor author?) who have found a great deal of support in writing groups and would feel it only fair to pay that support on to the newest member of the group, but eventually you have to do it on your own and you’d have to have enough self esteem to recognize when your friendly supporters are wrong. What is an amateur writer, by the way? It would take a long time to reach a point where you could give up the day job and some writers never do, so what is the division point between amateur and professional? What is the division point? Good question. Most people would say that a professional is someone who does it for a living but as Admin has repeatedly pointed out, just because someone is published doesn’t mean they know how to write well. And as you pointed out, a lot of writers (and I would add, a lot of good writers) still have day jobs and many never make enough money from their writing to quit those jobs. I can’t say for sure, but from what I can gather this situation is most prevalent in the field of horror and for those working mainly in the small press in particular. Writers like Charlee Jacob, Brian Hodge and Robert Devereaux are far, far better writers than many of the big names that dominate the mainstream but all three would still be considered minor authors due to their relative obscurity. Perhaps in this day and age with print in decline, bookstores going out of business and libraries closing down all over the place, writers are lucky if they can still call themselves a professional in any capacity. I’m lucky enough to be a member of an accidental writers’ circle – a small group of friends who all happen to write in various media and genres (some of us professionally, some of us semi-pro), who get together once every month or so to thrash out a few thousand words before retiring to the pub for the post mortem. It wouldn’t work if we didn’t trust each other to be brutally honest, though sensitive about each others’ work. They really are a blessing! Speaking of blessings, part of this blog’s Story Course seems to have vanished. Whenever I click on Part 3 (The Plot) I just get Part 1 (The Aim) again. As I’m struggling with the plot for my BFS short story competition entry, I’d really like to read Chris’ thoughts on the subject! Hi Peter – thanks for the heads-up – I’ve fixed it for now, but the section is due to change soon to make it easier to load. Re. learning ‘how’ to write, I can’t help thinking a big part is having a ‘musical’ ear: listening out for conversations, accents, quirky words and expressions etc. The rest is reading to the point of obsession. I notice Hilary Mantel has a similar view saying that she’d read so many books by the time she was 18 she: ‘knew how to write one herself…..that’s how I think it’s done. You learn the different ways as patterns, almost as visual patterns.’ – very true (I think). I’m beginning to think there is no real definition for professional writer except a self-applied one. P.G. Bell can even identify semi-pros in his group, but I wonder if that’s how those people identify themselves to him. Writers write to say something and once it’s said they go on to say something else. It’s the saying in print that makes a writer and professional or not may be irrelevant. A fair point, Helen. I use the term “semi-professional” because all of us in the group aspire to make our livings soley from writing. A few of us already do, but the rest of us (including me) only supplement our income with our writing. An awful lot of the stuff we produce either never sees the light of day (for better or worse) or simply doesn’t come with any financial compensation. That doesn’t make any particular piece of writing more or less valid or important than another, but it does help define how we make a living. I’m Trying To Read A Book!